“One final time I told myself I wasn’t abducting my little brother. Is it coincidence or something more sinister that draws them together? Many strange things collide in Laureth Peake’s life one hot August weekend. Perhaps strangest of all is the way her dad had been acting lately. And now he’s disappeared. It looks as if his obsession with coincidence might have fatal consequences. As Laureth sets off for New York with her strange younger brother, Benjamin, she has little faith in herself. But she has a burning determination to find her missing father. She has just one clue to follow; his notebook. Does it contain salvation, or madness? I have found that with every Marcus Sedgwick book I pick up there seems to be something incredible hidden between its pages, and She Is Not Invisible is not any different; even though it is in every way. This story was eye-opening, and I don’t mean to offend anyone with that saying. It follows Laureth and her brother on their trip over to New York to find her dad and in all honesty, it was hard to read because you quite often got the feeling that Laureth had very little faith in herself for this trip or any other, especially when she meets some of the people she does. There are many layers to the story and I don’t want to give any of them away so all I will say is that the book is absolutely brilliant and just when you think it can’t get any better it completely blows you away. There are a lot of topics explored within She Is Not Invisible and one of the main ones focuses on Laureth herself, it was an incredible read and unlike anything I have read before. Seeing the world through Laureth’s perspective was one of the main things that made this book a five star book for me and I think there needs to be Laureths on our pages, especially in YA books. The writing was incredible and I loved the style of the book with pages from Laureth’s father’s notebook interspaced between the chapters of the story. I also loved some of the stylistics around the book which are explained once you have read the book and I thought they were beautiful little touches and that Marcus Sedgwick must be on clever guy for pulling off some of the things he did. I honestly don’t think there was one thing I hated about this book, Laureth perhaps came across a little naive at times towards the beginning but I don’t blame her for that so much as her situations and I absolutely adored the addition of Stan as a character. The Benjamin Effect could have possibly been a little better explained and unfortunately I did kind of get the feeling that was there as a reason for doing certain things but I can live with these little story telling place holders in a book as incredible as this one. I would definitely recommend She Is Not Invisible to any avid reader and I will be telling all my friends to check it out too! 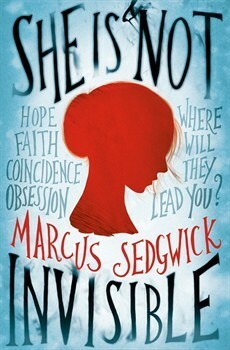 She Is Not Invisible was published on 3rd October by Indigo. My copy was sent to me from the publisher in exchange for an honest review. Wow, it sounds like such a good read! I have yet to try anything written by Marcus Sedgewick. If you’ve read a lot of his novels, what do you recommend to start with? All of his novels sound so interesting, and are so well received! Thanks for the wonderful review, totally checking this one out!